Normalization is the process of adjusting values measured on different scales to an imaginary common scale. If I talk in terms of an exam then Normalization is the process of adjusting marks obtained by students in a shift to a notionally common score. Bringing marks to a common level considering different difficulty levels across different shifts/slots of an exam is called Normalization and marks after adjustment are called Normalized Marks. It was all good till all students were getting same question paper in an exam. But scenario now is different. Because of increasing number of students, exams now are being conducted in multiple shifts/slots and each shift has different question paper. For an example, AAI recently conducted ATC exam in 3 shifts i.e. Morning, Afternoon and Evening Shift. So there are chances that questions in one shift can be tougher than other shift. In other words difficulty level of question paper in one shift can be different from other. So students who get easy question paper might score higher than the students in other shift with difficult question paper. Infact this can be easily noticed by looking at average score and total score in a particular shift. Average score and total score will be higher in shift with easy question paper. One can’t just say I was unlucky I got a difficult question paper. There must be something to ensure that each and every student across all the shifts in an exam should get a question paper with same difficulty level. So ‘Normalization of Marks’ is that something which was introduced to remove this discrepancy in exam. To make the game fair, Normalization of marks is done for all candidates who write the exam a particular post across all shifts. Usually the marks of students in shift with difficult question paper are increased proportionally to match with other shift in terms of difficulty level. Xav = total marks scored by candidates in a shift divided by no. of candidates in the shift. Standard Deviation of score for each Shift. Xav = Average which is total marks divided by no. of candidates. Now have a look at formula how AAI figures out normalized score of a candidate. A shift with highest average of raw scores is generally taken as the base for normalization. Based on the average score, we can derive that difficulty level of questions in Morning shift is High. Normalization will be done w.r.t. Evening shift marks. From the example above, You can see 75 marks in Morning shift are equivalent to 85 marks in Evening shift. Selection of low scoring student in tough shift instead of little high scoring student in easy shift thus make complete sense. Selection lists are prepared based on normalized scores instead of original scores. 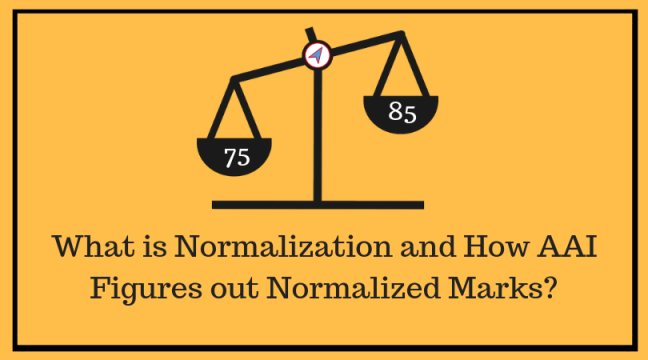 Hope you have now understand the concept of normalization and how normalized marks are figured out. Sir, what could be the expected cutoffs this year for final selection? Also please guide on how to prepare for voice test.